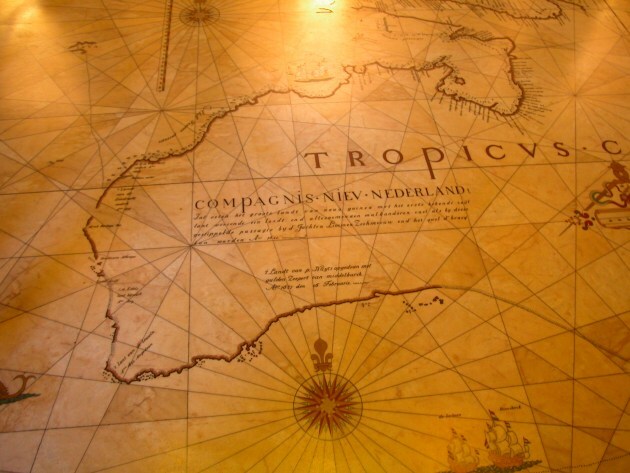 Photo: About Australia History - Early Dutch Map on Display at the Mitchell Library. Australia Tourist Spots - Sydney Itinerary. Useful Facts for Travel, essential for people wishing to visit this country and its premier city. Pictures, maps, places to visit, jobs and work, beaches and links to the rest of Australia. See the Sydney Weather for Today. Sydney has a temperate climate, with over 340 sunny days per year. Average rainfall is approximately 1210mm per year, and the summer season (Dec to Feb) can have strong sunny days, so wear a hat and sunscreen between 10am and 3pm. Summer average temperature 22 Celsius, Winter average temperature 13 Celsius. Note: The seasons are reversed from the northern hemisphere - Summer here is December to February, Winter is June to August. 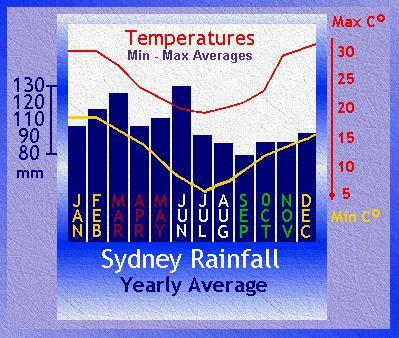 Daily Weather around Australia Climate in Sydney and Australia. Public transport is an easy way to get around the city. There are various travel cards available, such as the SydneyPass, which give you unlimited bus, ferry and central train travel. See also Sydney Car Rentals. Central Train Station, Circular Quay, Town Hall and Wynyard are major city terminuses for buses as well as trains. You can catch ferries and Jetcats at Circular Quay. Ferries can take you to Balmain, Darling Harbour, the North Shore, Manly (a great way to see the harbour), Rose Bay, Parramatta, Double Bay and Taronga Zoo. See more on Sydney Public Transport. To get to Bondi Beach, you can find buses to Bondi at Circular Quay and the Bondi Junction railway station. There are two tourist shuttle bus services, the Bondi and Bay Explorer and the Sydney Explorer. Travelling in a circuitous route to popular numbered stops and attractions, they provide you with commentary and a guide book. Enquire for prices at the Public Transport number below. See more about Bondi Beach. Both the Domestic and International Airports are at Kingsford, some 15kms from the city center yet getting to and from Sydney Airport has been made much simpler. Trains operate from both the domestic and international terminals at Sydney Airport, providing a quick and reliable way to get to the city and its environs. There is also a good bus shuttle service available to key areas and terminals around the city. Of course, there are a variety of Car Rentals and Hire available as well. See more information about Sydney Airport - Sydney Australia Airport - Travel Info about Sydney Airport. To be able to drive in Australia, it is neccesary to have a driving license with you when driving. If you can show you are a tourist in the country from overseas and your license is in English, you will not need to get any special permits. If your license is not in English, you will need a translation of your license with you when driving. Cars drive on the left side of the road in Australia, therefore look to your right first if walking and wanting to cross the road, observe speed limits as they are strictly enforced. If you are an adult, you may not have more than .05 blood alcohol level. If you are younger and driving, you may not have any alcohol in your bloodstream at all. Driver fatigue is an issue in Australia, particularly when driving long distances. It is neccesary to stop and rest regularly, every 2 hours is strongly advised. For more information about getting around with Sydney Public Transport, see Sydney Public Transport or Phone Sydney 131 500 (6am to 10pm daily AEST). See more on Sydney Public Transport. Country Trains Phone 132 232 NSW Country Trains. Airport Express Bus Service - Has buses running every 10 minutes to and from the airport. Airport Rail Link - City to Airport, 10 minute journey time every 10 minutes. Latitude 330, longtitude 1520 east, on the eastern coast of Australia. Note: The Sydney travel information provided here is a guide only - call the relevant organisation(s) direct to ensure accuracy. NOTE: Swim at beaches with lifeguards. Swimming at Australian beaches involves Swimming Between The Flags! Ask a lifeguard about the conditions for the day. Be considerate of them, they are there for you and your children! We wish you a safe and enjoyable stay. 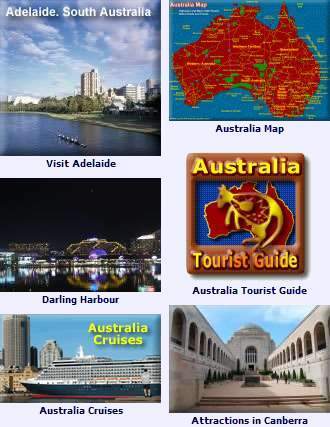 See visitors info about travel to Australia Visitors Info for Travelling to Australia. 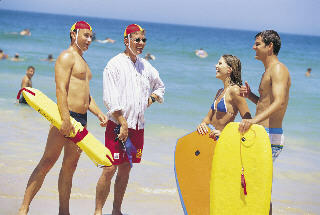 More information about Australia - see the Australia Tourist Guide.